Why the ACA is wrong and must be repealed. The Black Ribbon Project is participating in the Independent Women's Voice ObamaCare Video Contest. The deadline of midnight March 19th is approaching fast, but it's not too late to add your own original contribution. First prize is $5000---but the competition is pretty stiff. All entries will be posted on their website, however, so it's a great way to spread your personal message. 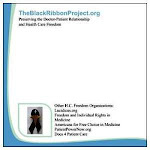 The Black Ribbon Project supports repeal of the ACA because of the way it tramples on the doctor-patient relationship--but more than that, it endangers the roots of civil society. What a great challenge to get to meat of the matter in under one minute! Be sure to check out the website and vote for your favorite. Some are really quite good! Shameless request: Vote for my video. From what I can tell, the winner is whoever gets the most viewer votes. Any winnings I receive will go to The Black Ribbon Project. Last fall, I was invited to speak about the Black Ribbon Project at the annual meeting of the American Association of Physicians and Surgeons. I took the opportunity to share a few of my thoughts on the principles we need to promote to effectively defend health care freedom and the doctor-patient relationship. I am pleased with how much I was able to cover in just 25 minutes. Let me know what you think!